The 526 Series Switchover is an automatic switchover system designed to supply a continuous supply of high purity, non-corrosive gas. The system comes with either flexible hoses for use with two cylinders or manifold connectors for use with the Maniflex Modular Manifold System. Due to pressure differential considerations, an integral line regulator is available to maintain constant downstream pressure. The 527 Series Switchover is an automatic switchover system designed to supply a continuous supply of high purity or corrosive gas. The system comes with either flexible hoses for use with two cylinders or manifold connectors for use with the Maniflex Modular Manifold System. Due to pressure differential considerations, an integral line regulator is available to maintain constant downstream pressure. 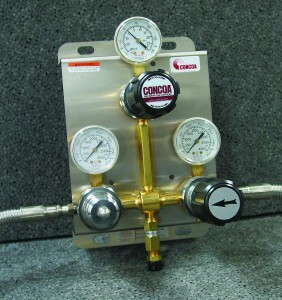 The 539 Series IntelliSwitch™ is CONCOA’ original fully-automatic computer controlled Universal Gas Management System that can provide continuous supply from either cryogenic liquid cylinders or high pressure gas cylinders, or any combination of both. These systems are ideal for use with high purity and ultra high purity gases for laboratory GC, GCMS, ICP or ICP mass spec support gases as well as for use with CO2 or Nitrogen for cell culture incubators. The proprietary software ensures optimal use and savings especially from cryogenic cylinders sources and can greatly reduce or eliminate venting and residual gas return with our Low Loss technology. The 530 Series Switchover is an automatic switchover system ideal for use in aerospace or parts cycle testing or process and pilot plant pneumatic control where uninterrupted supply of non-corrosive, non-oxidizing gas is required at high pressure. The system comes with options for multiple inlet configuration and can deliver substantial flows with stable line pressure up to 3500 PSIG. Ideal for use with Nitrogen, Helium, Argon, or Hydrogen where cylinder fill pressure can be as high as 6000 PSIG. At higher line pressure the unit will leave sufficient residual in cylinders in order to achieve those pressures.